I have always enjoyed weird and extreme stories of entrepenouship but nothing quite compares to Kyle MacDonald and his “One Red Paperclip” story. He is now famous for being able to trade his paperclip for a house! This was no easy feet and he had to go through a series of interesting trades. Here is the list that he went though. On July 14, 2005, he went to Vancouver and traded the paperclip for a fish-shaped pen. He then traded the pen the same day for a hand-sculpted doorknob from Seattle, Washington, which he nicknamed “Knob-T”. On July 25, 2005, he traveled to Amherst, Massachusetts, with a friend to trade the Knob-T for a Coleman camp stove (with fuel). On September 24, 2005, he went to San Clemente, California, and traded the camp stove for a Honda generator. On November 16, 2005, he made a second (and successful) attempt (after having the generator confiscated by the New York City Fire Department) in Maspeth, Queens, to trade the generator for an “instant party”: an empty keg, an IOU for filling the keg with the beer of the holder’s choice, and a neon Budweisersign. On December 8, 2005, he traded the “instant party” to Quebec comedian and radio personalityMichel Barrette for two Ski-doo snowmobiles. Within a week of that, he traded the snowmobiles for a two-person trip to Yahk, British Columbia, in February 2006. On or about January 7, 2006, the second person on the trip to Yahk traded Kyle a cube van for the privilege. On or about February 22, 2006, he traded the cube van for a recording contract with Metal Works in Toronto. On or about April 11, 2006, he traded the recording contract to Jody Gnant for a year’s rent inPhoenix, Arizona. On or about April 26, 2006, he traded the one year’s rent in Phoenix, Arizona, for one afternoon with Alice Cooper. On or about May 26, 2006, he traded the one afternoon with Alice Cooper for a KISS motorized snow globe. On or about June 2, 2006, he traded the KISS motorized snow globe to Corbin Bernsen for a role in the film Donna on Demand. On or about July 5, 2006, he traded the movie role for a two-story farmhouse in Kipling, Saskatchewan. You can see the full story via the blog used to record the journey here. He has even written a book about the story which can be found in many good retailers. This story has been told in various incarnations, some notable ones include being used in a VW Polo advert which sums up his story rather well. I was wondering if it is at all possible to replicate this success. I also have one red paperclip and I would be interested to see if anybody will be interested in trading my paperclip for anything. 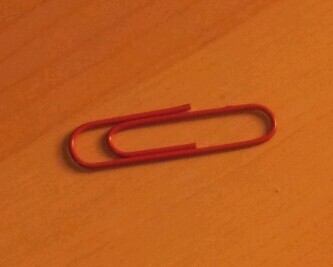 Below is a picture of the paperclip in question. Of course I am not in this for any gain and I will donate the proceeds of anything that I trade to charity – which will be decided (or at least affected) by the people that will be willing to trade with me. This is purely an experiment to see just what can happen. Let me know if you want to trade.